As mentioned previously, we are spending a night at a hotel near Heathrow so that we only have a short distance to drive on the morning we fly to Russia. Also due to Pat recovering from back surgery and a hip problem, we are less mobile on this trip than previous trips and as well as a suitcase and a rucksack, we have a travel wheelchair to cope with. So staying near the airport, with a view of one of the runways seems to be a good idea. Airlines have become very disability friendly over the past few years and we have booked support at both Heathrow and Saint Petersburg. Check-in and getting to the gate was very easy although we suffered slightly from this being one of the busiest weekends in the year for travellers at Heathrow. The flight was uneventful and allowed us to take the usual very poor selfie. We had specified that we wanted to be met at the arrivals gate by someone with an airport wheelchair. For us the great advantage of this was that our wheelchair pusher bypassed the queues at immigration and took us straight to an official who with the usual humourless face and attitude, stamped our passports. There was a slightly nervous wait at Saint Petersburg baggage retrieval for our wheelchair to arrive on the luggage carousel but eventually it did so and we had arrived with all of our luggage. 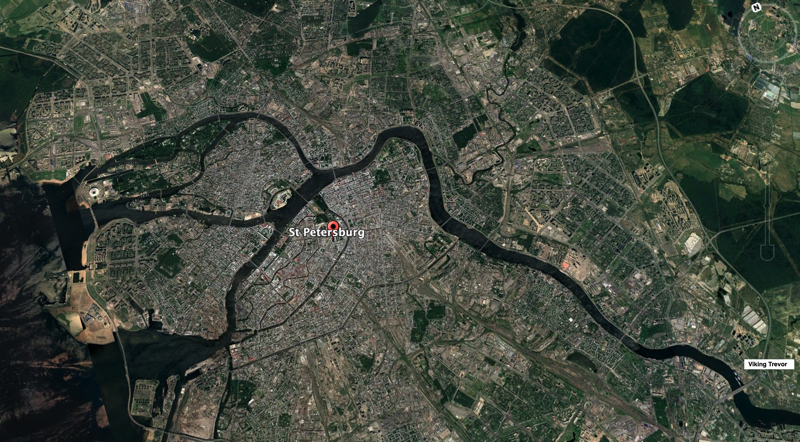 Viking boats, and it seems all other longer distance boats, moor some distance out of the centre of Saint Petersburg at a place known as The Salt Pier (bottom right of the picture below). It was about 30 minutes from the airport however and we did not have to drive through the city and suffer its very slow traffic. In summary, getting to Trevor was quite easy and not too tiring. As is always the case, these blog entries are a personal record of one of our trips. And just to make it very clear, neither of us have any association with Viking or anyone other company and in fact, they have no idea that we are writing a blog and we will not be telling them that we have done so. Having been on only two cruises in our travelling years (The Akademik Ioffe to Antarctica and The Minerva around the Lesser Antilles), we are not cruise experts and so we do not really know what to expect, all we know is that we want to enjoy ourselves. 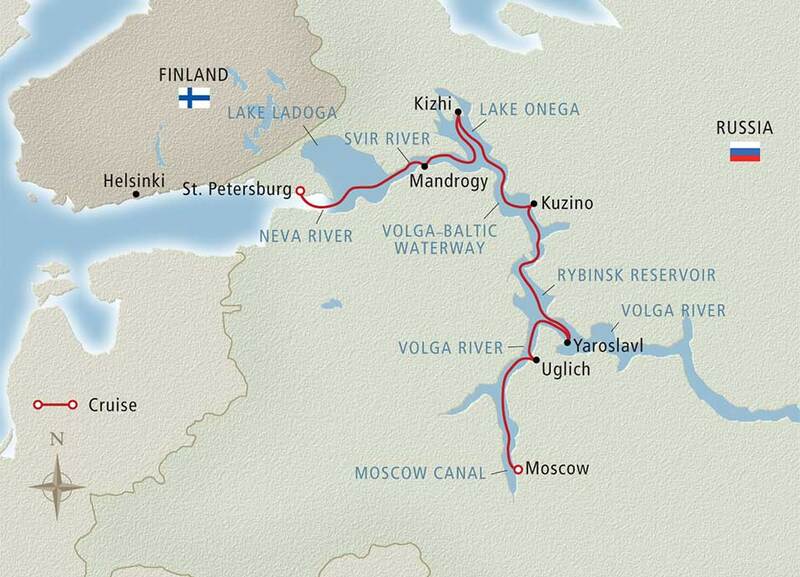 This time we are taking one of the standard Viking canal cruises from St Petersburg to Moscow. We did a lot of consumer research before deciding both to book and to choose which direction to go in. Amongst the blogs and articles we read were this one here; this one here and this one here. Practically all of the reviews we read were positive but at the time of writing this blog entry, we have not started our trip so it will be interesting to see if our view at the end is also positive. We chose to go in the Saint Petersburg to Moscow direction partly because the dates suited us better and partly because we thought we would prefer to start with The Hermitage and to see what Saint Petersburg had to offer and then to end with the traffic jams of Moscow. We booked some while ago responding to a “£1000" off offer in the press. Monitoring sale prices over the following few months showed us that the offer was reintroduced in various guises quite regularly over the following months. By booking early however we did get our first choice of cabin and as of today, it appears that the ship is nearly full. Some three months before the trip, our flight details arrived. We are flying from and back to London on scheduled British Airways flights at sensible times (neither early in the morning nor late at night). The peculiarities of BA mean that no free food is on offer on the flight out to St Petersburg (which according to BA is a European destination) but free food and drink is on offer on the way back because Moscow is a World destination. Our insurance company however regards all of Russia west of the Urals as being in Europe. We decided to spend the night before the outbound flight at a hotel near Heathrow and also to buy a "stay and park" package. As is often the case, if you hunt around on the internet you can get a really good deal. 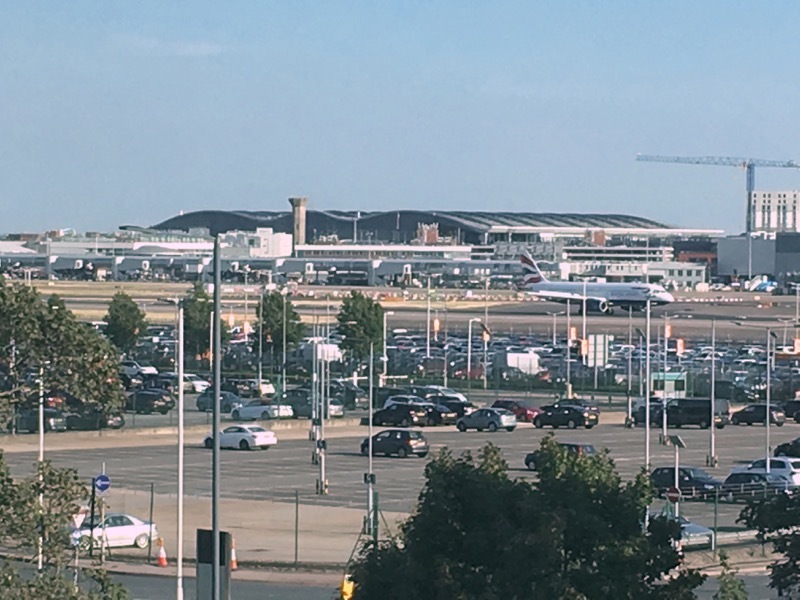 Using the BAA website we got 12 nights parking in Terminal 5 Long Stay plus a night at the nearby Hyatt for £129 which was £4 cheaper than the cost of parking alone had we only purchased parking at T5 Long Stay. The process of applying for a Russian visa is long and complex. Whilst 2018 World Cup Football fans seem to have been offered a short route to getting a visa, this is not available to the ordinary tourist. We chose to use the services of Viking's preferred visa partner (Prima) because there were too many questions on the visa application form which we did not understand. Over twenty pages of instructions arrived from them in one document and four in another and the resultant completed and printed visa application was six pages long. "List all of the countries you have visited in the past ten years including dates and reasons for travel” caused us some problem as did “give the number and validity dates of your previous passports” and “give the number and validity dates of your children's passport”. For those who are facing this ordeal, I can advise that it took me around two hours to complete the first application and one hour for the second, a process not helped by the fact that the guidance notes referred to an earlier version of the passport application process (apparently it had been simplified). Visa applicants also have to go to one of three UK centres to have their biometric measurements (finger prints) taken. So on the appointed day, at the appointed time, we presented ourselves at the visa processing centre in London to have our fingerprints taken. The staff there were very helpful and because one of us was in a wheelchair, they immediately took us into a side room (bypassing the queue), took our fingerprints and we were out five minutes after arriving. Until this application, we thought that the India Visa Application Process was the hardest and most expensive we had experienced - we now know that the process for Russia is much harder by a long way. It is also the most expensive visa we have ever had to buy at a total cost of £233.20 each, a figure which includes the cost of the visa, a letter of invitation from our tour company to go to Russia and Prima's fees (for checking our papers, meeting us at the visa office to hand back our papers, and collecting our passports when the visas are ready. Posting them back to us then adds an additional fee !) On top of this we also had to add the cost of new photographs, postage and travel to London. Using the Viking website, we had to select which of the included and which of the "extra cost’ trips we wanted to take. All of the “extra cost” trips are quite expensive but since we do not see ourselves going to Russia again, we accepted that it was pay and do it now or never ever do it. And about two weeks before we left, a long list of “additional shore excursions” arrived for us to choose from if there was space in our already planned itinerary. Getting home was very easy, the planes were on time although they were slightly fuller than on the way out. This was our sixth year participating in National Immunisation Days and our fourth year leading a team. Over this period, we have noticed a change in the role of Rotary Clubs and Rotarians during the immunisation period, namely that the process is now less dependent upon the enthusiasm and effort of Rotarians and that the Indian Government now almost totally runs immunisation. In the early days, we came across very few health workers involved in vaccination, now there are very many health workers involved and also they work out of health centres. This is of course because the current policy of the Indian Government is to move away from the use of live polio vaccine and for all children to follow a vaccination programme from birth and during their early years. We met many Rotary Clubs in Kolkata and all of them were very hospitable and welcoming and we thank them for that. We were very impressed with how organised they were and also how they have moved on from simply responding to Polio to running other community health projects. Will there be another last NID we might wonder? At the time of writing, the answer is “probably yes” but there is some debate as to if it will involve Rotary or if it will be totally run by the Indian Government. If we can, we will go. We are committed to continue the fight against Polio as long as we are able. And if you want to watch a 20 minute presentation about Rotary and Polio, click on the above YouTube video. 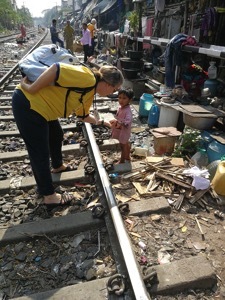 and many more live in squatter huts or alongside the railway track. Some people there are relatively wealthy and others are abjectly poor. There is an short article in the Huffington Post about the colony here which will provide some useful background if you do not know anything about it and a Youtube video above which provides rather a long view of the area. Kolkata has a interesting history. 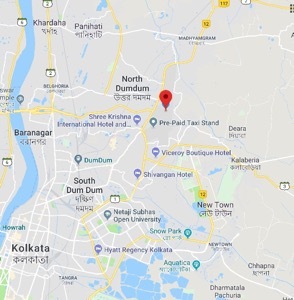 From the days of the East India Company through until 1911, it used to be the capital of India and hence it had a large British garrison (some of my family were born there). Roll forwards to recent times and the Communist Party of India (Marxist) were the ruling party in West Bengal. Local politicians are very important and hence just before the start of our follow-up we met the ward councillor for the Colony and she decided to accompany us as we worked our way around the colony checking fingers and she was very effective and well known and would not accept any excuses from those whose children had not been vaccinated. Polio is primarily spread through faecal contamination and India has been increasing the number of public and private toilets available to its population in an attempt to improve sanitary conditions. This public toilet was on the edge of the area we were checking (and there are some 350 others in the city) but unlike many places elsewhere in India, here it was "pay to use” and hence we did not see many people using it. There was some, but not a lot of publicity material around telling people to get their children vaccinated. The growing role of government in the vaccination process is perhaps indicated on this poster by including a photograph on it of Mamata Banerjee who is the Chief Minister of West Bengal - a photograph we were to see on most Polio advertising. and looking at the little finger of their left hand for the purple mark. Some children know what to do and you only have to waggle your little finger at them and they will respond. then they are immediately given their two drops of vaccine. The vaccine is, as always, carried in insulated thermos boxes because it must be kept at a low temperature in order to remain effective. because word had rapidly spread that if he was vaccinated by us, he might get a small present. Working on the railway track was an unusual experience. Many people had set up “shop” adjacent to the track and were just that extra millimetre away from the track to avoid being hit when a train went past. and the track was live with trains frequently passing (slowly). We soon learnt to get out the way and carry on checking on the other side of the track. As is always the case, we were welcomed in a friendly way by everyone we met and this child had quickly got over being vaccinated by me. “Houses" were marked up in chalk as usual showing that they had been checked (Team 59 checked this house on the 29th January 2018 and it passed - i.e. the children supposed to be living in it were inspected and found to be vaccinated). It was a very interesting place to work and we found that the usual thoroughness of the Indian Vaccination process was as obvious here as it has been elsewhere - most children had the required blue finger. and found Health workers working on the landing stage looking for evidence of vaccination on all children who went past. From our perspective, this NID is intended to follow much the same format as earlier NIDs: we fly to Delhi for a briefing and for most of the team to assemble; we then go to Kolkata and the following day (Saturday) we take part in some Polio related activity; Sunday is the day of the NID; Monday is followup and then sometime afterwards, we return to Delhi and the UK. Experience has taught us that going on a NID without allowing some time to get over the jet lag of India is very tiring, hence we are going out to Delhi a few days early. And this time we are making the journey even easier by going on a day-time flight rather than an overnight one. So, as has been the case for the past few years, I start this blog entry with a badly taken selfie of us on our fairy empty Air India plane at Heathrow. We arrived just before India Day and hence a lot of Delhi was under lock-down and as expected, the view of Delhi from our hotel room was showing the impact of the early year smog which can make living there quite unhealthy. Over the next couple of days, most of the 100 UK Rotarians taking part in the NID arrived and we all attended the usual pre-NID briefing session which did not tell us much that we did not already know but did indicate that during the past 12 months, India had made some further progress towards replacing Live Polio Vaccine given orally with the Inert Polio Vaccine in an injectable form. Other than the slowest imaginable drive back to the airport to get our flight to Kolkata due to India Day traffic, getting there was unremarkable and not needing comment. serious about being actively involved in Polio vaccination - "we have not come to watch but have come to do". For us the day finished with seeing sunset on the Hoogly River in Kolkata. we divided into small teams and set off to vaccinate. and the area we went to was north of the airport. The immunisation process has changed a lot over the past few years and here I thought that there were far fewer of the posters I had grown used to seeing on display around the city. and the general poverty in some of the areas we went to on this day was not better or worse than we have seen before. and to incorporate it into a programme of fully vaccinating every child against a range of infant diseases. at birth and at specific dates in their early years. There has also been a significant move towards the establishment of teams of health workers such as these who staff local health centres and deal with all aspects of children’s health. Not all of the health centres we visited were as grand as the first one, this one above was simply a room at the side of a building. However, within it the vaccination process took place in the usual way. although without the pressure of numbers of children waiting their turn which we came across in earlier years. Although the same method of recording the numbers of children vaccinated was used as in previous years, at all of the health centres we went to, the workers said they knew exactly how many children they were expecting and where they lived. because she recently had had Cataract Surgery on one eye. And we finished this first day with fresh coconut juice from a coconut purchased from a road side stall, not something you can do where we live.